World boxing champion Carl Froch insisted on having his photo alongside Nottingham's brilliant Cloughie statue after becoming a Freeman of the city. The Master Manager is Froch's hero and the photo topped a memorable day in which he followed Brian's footsteps by being honoured with Freeman status and having a tram named after him. "It was a truly emotional day," said Froch, who was born in the city and is a Nottingham Forest fan. "But there was one thing I had to do before the night was over and that was to have my picture taken with the Brian Clough statue with the scroll in my hand. What a man and what a legend he is." In an interview with the BBC, Froch was surprised to learn that Cloughie had kept the casket containing his Freeman scroll on top of the restored mangle his mother used. Brian said it meant his whole life was summed-up in a small part of his dining room. Froch said he expected to put his scroll in a special cabinet with his world title belts. Referring to the photo with the Cloughie statue, Froch said: "That picture will mark the day as such a special occasion and will go in with the scroll and my world title belts. It was a big event to organise and to receive it in front of so many people as well - it was a very proud moment." The 37-year-old had received the honour at a special ceremony in front of more than 2,000 of his supporters at Nottingham's Royal Concert Hall (October 16, 2014). 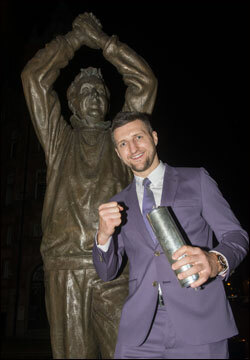 These photographs of Carl Froch with the Cloughie statue are courtesy of Nottingham City Council and Tracey Whitefoot. Chelsea boss Jose Mourinho says he can't be compared with Cloughie - and described the Master Manager as a legend. It follows comments by Crystal Palace's Neil Warnock who said Mourinho and Clough were "cut from the same cloth" and that the Premiership boss was "the nearest thing to Cloughie." In response, Mourinho was full of praise for Old Big 'Ead and admitted he was flattered. "I think there is no comparison," he said. "Mr Clough is a legend in English football. What he did, especially with Nottingham Forest, stays forever. He's a real legend. I think it's a big loss for English football that he went so early. If Neil makes that comment, obviously it makes me proud, but I think the legacy of Mr Clough has no comparison here." 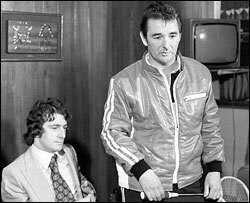 Fans of Brian Clough are continuing to remember the football genius, ten years after he passed away (September 20th, 2004). Supporters of both Nottingham Forest and Derby County joined a minute's applause during their recent league match at the City Ground, while one thousand Forest fans were given replicas of his famous green jumper to wear at the Reds' League Cup match at Spurs. Forest's club ambassador John McGovern, who twice lifted the European Cup under Cloughie's management, said: "Brian was simply the best. There will never be anyone in football quite like Brian again. He is synonymous with Nottingham Forest and to see one thousand Forest fans in green jumpers at such a high profile game will be a fantastic way to mark the anniversary." The jumpers will also remind fans of the green jerseys sold by the Brian Clough Statue Fund to help raise money for the superb bronze sculpture of the Master Manager which stands proudly in Nottingham city centre. The Nottingham-based cup sponsors Capital One used the statue for its publicity photo's to promote the jumper giveaway. Meanwhile, in a special interview with BBC Sport, Brian's son Nigel says his father would have been a success in the modern game but would have been 'dismayed and flabbergasted' by the money-men and agents. He also says that success allowed his dad to be outspoken and feels the same is true of Chelsea boss Jose Mourinho. Nigel is also confident his father would never have moved to the boardroom after management, as Sir Alex Ferguson did. "When he retired from Forest he didn't want to haunt the next manager, Frank Clark," said Nigel. "There was a lot made last year of Sir Alex Ferguson being around when David Moyse was struggling and whether that was a help or hindrance. "I don't know, but my Dad wanted to divorce himself from that. Being in the boardroom would have been a step too far for him." As for a phrase to sum-up Brian, Nigel referred to words used by a famous comedian. "I read that one of the phrases Billy Connolly uses is: 'Times may change, but standards must remain.' I think he got it off an After Eight advert. But I can see my Dad using something like that. "He would have been nearly 80 if he was still around and he would have still been a cantankerous so and so at times. But those standards he was brought up with and tried to instil in others would have still been along those lines." 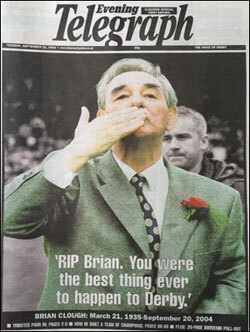 Ten years ago, the headlines in national and local newspapers were dominated by the news that Cloughie had passed away. 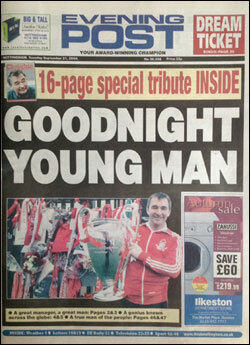 The front page of The Sun declared 'Bye Bye Big 'Ead', while the opening paragraph on the back page read: "Brian Clough's death brought the football world to a juddering halt." The report continued: "The profound loss of the best manager never to boss England stopped the great and the good in their tracks." The Daily Star's Brian Woolnough, who has also since sadly passed away, wrote: "If there is a football team up there in heaven, they are lucky. Trophies are on the way." The chief sports writer of The Times, Simon Barnes, described Cloughie as the man who singlehandedly created the cult of the football manager. The front page of the Daily Mirror used one of Brian's famous quotes as its headline - the quote originally unearthed several years previously by this website and salvaged for posterity from a regional TV interview. 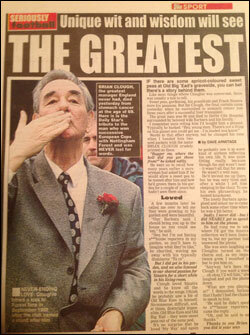 It would have been lost forever without publication on this site and is now used widely to sum-up Cloughie's genius and outspoken nature: "I wouldn't say I was the best manager in the business, but I was in the top one." 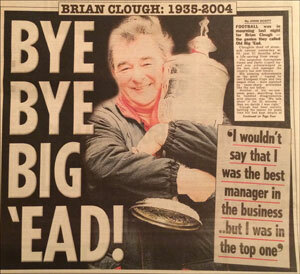 In an article headlined 'Clough, A Man of the People,' The Mirror's chief sports writer, Oliver Holt, praised Brian's man-management skills and said: "...it was his ability to inspire players, for getting the best out of players that others considered ordinary, that was the hallmark of Clough's genius." The Daily Mail's Jeff Farmer paid tribute and wrote: "Brian was a genius not only at the game he rampaged through like a tornado - and for which he motivated men to play like demons surpassing all understanding of themselves - but at cushioning the most abrasive of his tirades with a rough but engaging charm." You can reflect on Brian's memorial service HERE and Nottingham's civic tribute HERE. There are also memories of the unveiling by Mrs Clough of Nottingham's bronze statue HERE. An archive interview with Cloughie appeared in a special documentary celebrating fifty years of TV's 'Match of the Day' (August 2014). Speaking back in 2004, Brian recalled the early days of the programme and how he would have to rush home from the cinema to watch it, before the film had finished. "We used to go the pictures on a Saturday night. We had to leave to get home to watch it. So my wife complained for many years that she'd missed the last ten minutes of every film she'd ever watched." Cloughie is also featured in the opening pictures of the new series of 'Match of the Day,' wearing his famous green jumper. A close friend of Brian Clough says he will never forget the Great Man's kindness and generosity. Colin Shields was one of the few people, besides the players, who Cloughie would allow to travel on the team bus. He also admits he found it difficult to call him Brian initially - because he was so in awe of him. Colin told this website: "I had admired Brian's teams from the terraces for many years. Getting to know him personally made me feel like a football millionaire - he gave me opportunities and experiences I could only have dreamt about. He opened so many doors for me, it was like fantasy football - but in real life." Colin was a trusted friend for more than twenty years and has described his memories in a book which will benefit the Royal British Legion and the NSPCC, as well as this website. "Brian was kind, thoughtful and loyal," added Colin. "We trusted each other implicitly. I consider myself very lucky to have become such a close friend of a man I regarded as a hero - and still do." The book 'Champagne Memories - How Brian Clough Changed My Life' adds many previously untold stories to the Clough legend - illustrating his unbounded generosity and intriguing unpredictability. It is a fascinating account of life with the Master Manager in which Colin recalls many poignant memories of their friendship. "Having originally admired Brian's teams as an ordinary fan, I could never have imagined that he would eventually let me travel on the team coach and that we would also drive together in the car to matches and social events," said Colin. "The team bus was hallowed ground as far as Brian was concerned - even the directors weren't allowed on it." From behind the scenes at TV appearances to carrying bags of laundry together while on holiday in Majorca, Colin has described for the first time how even the mundane became memorable in the company of the charismatic Clough. "We had some wonderful times in Cala Millor in Majorca. Sometimes the players would be with us and at other times it would be just family and friends. It was great just to spend time with Brian away from the limelight, doing ordinary things." Colin was so impressed with the football played by Brian's teams that he gave up a season ticket at Derby County in order to follow his hero to Nottingham Forest. During one match at the City Ground, Brian asked to use Colin's season ticket for a friend - and gave Colin the surprise opportunity of sitting on the Forest bench to watch the game. This September marks ten years since Brian passed away and Colin says he still sorely misses his pal. Although he has since returned to Cala Millor, he says it was not the same without his good friend. "I realised then that the surroundings didn't matter - it was the company that was important and there was just this huge feeling of emptiness without Brian." 'Champagne Memories' has been written with the help of author Marcus Alton who is also the editor of this website. It is published by DB Publishing and signed copies are available to order on this website at a special discount price. You can read more about the book and order a copy HERE. Next month marks ten years since Cloughie passed away (September 20th, 2004) and we'd like to hear about your favourite memories of the Great Man. The BBC's former chief football correspondent, Mike Ingham, has described how waiting to interview Brian was one of his top ten memories from nearly three decades covering football all over the world - because his patience would always be well rewarded by the Master Manager. 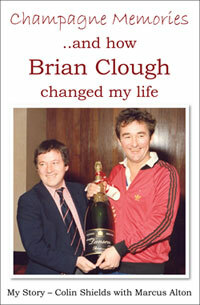 "It was waiting from dawn to dusk to interview Brian Clough in the 70's," says Mike. "The time of appointment was immaterial. You always had to wait and you did wait because you knew that when he did finally arrive with his squash racket in hand it would be pure gold-dust." Former Nottingham Forest defender Frank Clark has revealed how Cloughie threatened to fine him if he trained on his days off. Clark says he wanted to go running near his home to keep fit as he approached the end of his playing career - but Brian was having none of it. "Brian was way ahead of his time in the way he dealt with players and we used to get quite a few days off," explained Clark. "I used to live in the village of Lowdham and I would go out running occasionally - nothing strenuous and too far, but enough to keep myself ticking over." But Clark says a supporter must have noticed him and wrote to the papers about it. Referring to Cloughie, Clark continued: "I went into the ground one day and he went absolutely beserk. He said, 'When I give you a day off, you have a day off. If I find out that you've been training on your days off, I'll fine you.' I tried to argue with him, but I lost the argument." Clark says that over the duration of two seasons, he never missed a match and played 108 consecutive games. At the end of the second season, Clark said Cloughie called him in and asked: 'So, who's right now, then?' "I didn't know what he meant - but then I realised that's what he was talking about from two years ago. He'd not forgotten that argument we had - and that was typical of his attention to detail." Clark was speaking to Notts TV in a special programme to mark 25 years since Forest won the European Cup. We're sorry to hear of the death of one of Cloughie's first signings at Hartlepool, Terry Bell, at the age of 69. Nottingham-born Bell was top goalscorer in the side's historic first promotion season back in 1967-68. After playing in midfield in his early career he had been converted to a striker under Brian's management - with great effect. The Hartlepool Mail says Bell enjoyed legendary status at the club and received a heart-warming standing ovation as a guest at the club's centenary dinner. In the book 'The Day I Met Brian Clough' - compiled by website editor Marcus Alton - Bell says he enjoyed playing under Cloughie. "I remember he used to take us down to the beach for training sessions," he recalled. "Brian had been an outstanding goalscorer, so as a centre-forward who scored a lot of goals I really enjoyed playing for him." Bell had also recalled with a smile how he poured a bucket of water over Brian - by accident. It was a case of mistaken identity! Adds Marcus: "It was a privilege to speak to Terry and hear his lovely memories. His family are very much in our thoughts at this sad time." Advice from the Master Manager has helped a former Cloughie player secure a place in the Conference play-off final. Gary Mills, who was a teenager when he won the European Cup with Brian at Nottingham Forest, is now manager at non-league Gateshead. Mills' side face Cambridge United at Wembley on May 18th, to fight for a place in the Football League. It follows Gateshead's victory over Grimsby in the semi-final. Speaking to the BBC, Mills said advice from Brian all those years ago had paid dividends. "What I learnt from him is the game is simple, so keep things basic but make sure the players enjoy it," he said. "The season is long, so you have to enjoy it from day one. Yes, you have good and bad times, but you have to try and smile all the time." Victory over Cambridge would see Gateshead return to the Football League after a 54-year absence. Twenty five years ago, Cloughie was reflecting on a successful trip to Wembley, after beating fellow First Division side Luton Town in the Littlewoods Cup Final. It was to be the first of two consecutive League Cup final wins. In his programme notes for the following league match (April 1989), Brian was full of praise for the Forest fans. He wrote: "You did us proud at Wembley on Sunday and, once we had got on the front foot in the second half, I think we did you proud too." Forest had gone a goal behind before two goals from Brian's son Nigel and another from Neil Webb helped them win the trophy. Brian continued: "I said before the match that I would rather be sitting at home with my grandson watching the game on television, keeping my fingers crossed that we won and hoping that my son got a goal. I can tell you I missed not being with my grandson but at least in years to come I will be able to take a leaf (or is it leak?) out of Max Boyce's book and tell my grandson: 'I was there.'" 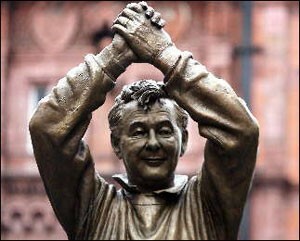 Cloughie also reflected on the significance of lifting another major trophy. "Even the hassle of getting back up the M1 on Sunday night was made tolerable because we saw for ourselves that we had put a smile on so many people's faces. And what we also did in beating Luton 3-1 was put at end to all the stick we've taken because we haven't won a major trophy for yonks. "If I had had a pound for every time I've seen it written that 'Cloughie hasn't won a trophy for so many years' I could buy Wembley stadium and have a few bob spare to pay for the refit that's going on. It was lovely to be back there, great to see us win and I couldn't have been a happier man as I trooped off down the tunnel early to let the lads get on with their celebrations." At the end of the month, Cloughie's side were back at Wembley, beating Everton in the Simod Cup Final. A special tribute has been paid to Cloughie by former England striker Trevor Francis - who said the Master Manager is still sadly missed, as we approach the tenth anniversary of him passing away. Francis also revealed how his mind was made up to sign for Forest, even before he arrived for talks at the City Ground. Francis said Cloughie had a special presence which affected everyone around him. "Wherever he was, when he walked in a room he had this aura around him and everyone stopped. Not many people have that. Even when he was on television, I used to think he was compelling viewing. He's a sad loss, he really is." Brian was a big factor in Francis' decision to join Forest and the striker says although the initial discussions lasted nearly four hours, he had already decided to sign for the Reds, if the financial offer was right. Francis is pictured (below) with Cloughie who arrived at the ground following a squash match and was still holding his racquet. Francis told the Sky Sports 'Fantasy Football' show (March 2014) that he had asked for a clause his contract to allow him to leave Forest if Clough left the club. But Brian replied that Peter Shilton had already asked for the same clause and the Football Association had turned it down. Francis, who scored the winning goal for Forest in the 1979 European Cup final, was asked whether Forest would have been as successful without Cloughie at the helm. Francis replied that when Brian spent time in the sunshine in Cala Millor in Majorca, his assistant Peter Taylor would take charge of the team. "As good as Peter was as a Number Two, he was not the Number One and you could guarantee we would lose the match without Brian Clough being there. So I think that answers the question." Francis also described how Brian angrily accused him of cheating after his first match - a goal-less draw against Ipswich. "It was a lacklustre game and with seven minutes to go a cross came over and I couldn't quite get on the end of it - so I punched it in. I thought I'd got away with it. Afterwards, I got the biggest verbal volley from Cloughie. He said, 'Listen, you're not playing for Birmingham City now. This is cheating. We're Nottingham Forest and we do things in the correct way. Don't ever do that again." Former England defender Des Walker has described how Cloughie was a father figure to him, after leaving his home in London as a teenager and joining Nottingham Forest. Walker, who earned 59 caps with his country, said Brian was clearly the best boss he ever played for. "I came to Nottingham as a 16-year-old and he was a role model, he was like a Dad," said Walker. "He had that skill of getting the best out of yourself. He was by far the best manager that I ever had - by a long way. For me, he simplified the game. He didn't ask you to do something you couldn't do. "He asked you to do what you could do - and do it well. That was one of his biggest strengths." Walker said he always hoped to be praised by the Master Manager after a match. "You played the game to hear him say at the end of the 90 minutes, 'Well done, son,' - it gave you such a lift because it wasn't often. It was such a big pat on the back." Walker, pictured above listening to Cloughie, admitted that he never knew what to expect next from Brian - and that could influence how you felt towards him. But the former defender knew Clough's opinion would inevitably be correct! "I respected him because I had never come across anyone like him," said Walker. Speaking on BBC Radio Nottingham's Pre-Match show (March 2014), Walker said: "In football and management, he was never wrong." He then added with a laugh: "He would love to tell you he was never wrong anyhow!" "No two days were ever the same. You could like him or hate him, but you never stopped respecting him. He brought out the best in the players he had. He helped every player who played for him for any length of time - not only as a footballer but as a person." To mark what would have been Cloughie's 79th birthday, we're going you the chance to win a special picture featuring the Cloughie statue and one of his famous quotes. The print, which brilliantly captures Brian's humour, features part of a well-known Cloughie quote and one of Nottingham's famous residents - a pigeon from the market square. It's been compiled by Nottingham artist Corrina Rothwell, who based the picture around the statue, which was originally unveiled by Mrs Clough after a huge fund-raising campaign by fans. The quote refers to Cloughie's comment which was originally spotted by this website and placed on the Quotes page for posterity. In an interview following his life-saving operation, he said: "Don't send me flowers when I'm dead. If you like me, send them while I'm alive." Corrina told this website: "Brian Clough's statue is so popular that it just had to be featured in my 'From Nottingham With Love' print series. I'm really pleased with how the image works, with the silhouette of the Watson Fothergill building in the background." A theatre producer has told this website he is planning a special production to celebrate the life of Cloughie. Mark Whiteley from the Hard Graft Theatre Company in Oldham is originally from Nottingham. He hopes the show will feature the stories of fans who met the Great Man. "I'm a huge Clough fan," says Mark. "He was such a fantastic man - there is no-one like him in football these days and we miss him. I'd like to produce a celebration of his life - so Dads who remember those brilliant days can take their own children to find out more about Brian Clough." Mark hopes the show will start in the East Midlands before going on tour during 2014 - marking the tenth anniversary of Cloughie passing away in September. Brian's son Nigel has described how his Dad was able to deliver a motivational message to his players in just a few words. Nigel, who played for the Master Manager at Nottingham Forest, agreed that when it was necessary, his Dad could be very economical when it came to speaking to players before a match and at half-time. "It was the truth, short and sharp and to the point," Nigel told BBC Radio (February 2014). "And it didn't leave anybody with any misunderstanding of where they stood in the situation. At half-time, he certainly didn't talk for the full ten minutes in those days. I don't know what he'd have done with the full 15 minutes these days. "But he could get his point across in thirty seconds - less than that sometimes - and we all knew what we'd got to do from there." Nigel also said his Dad could hand-out collective and individual rollickings to the players. "Whatever was needed on the day. You can have nine or ten in your team who do particularly well and on the day you're let down by one or two and I think it's important to point out to them in the dressing room." Nigel was speaking before his League One side Sheffield United's fifth round FA Cup tie against Championship Forest. He was asked about the Reds' defeat to Spurs in the 1991 FA Cup Final, a match which saw Paul Gascoine stretchered off after committing two horrendous challenges. Nigel agreed that Forest should have won the game and that his Dad had struggled to get over the events of that day, leaving the FA Cup as the one trophy that eluded him. "I think of Roger Milford (the referee) quite frequently," said Nigel. Referring to Gazza, he added: "He left the field after two of the worst tackles you will see on a football pitch and without so much as a yellow card, which is still bewildering to this day." Of Forest's fortunes that day, he commented: "It was the one chance - I think it was on for us that day, but unfortunately events turned against us." Nigel, pictured above as Burton Albion manager with his Dad and the famous trophy, was also asked how Brian would have fared in the modern game, particularly with the increased influence of agents and a new breed of owners. "Agents were just on the increase as he was leaving - so that was a good thing," laughed Nigel. "He just wanted to deal with the players." Nigel said there had been stories of players being asked to sign blank contracts, even though they pointed out to Brian that there were no figures (wages etc) on the documents. Nigel said his Dad would say something like: 'Well, you trust me don't you?' In those situations, it was all about trust. "They would sign the blank contract and everything was absolutely to the letter what was agreed, so if that trust was there, you didn't need someone else." Speaking about how the game has changed over the years, Nigel said: "A lot of the values and everything that he was brought up with and stood for within football are being undermined these days unfortunately. So I think he would have struggled with that aspect of it. He wasn't keen on the chairmen and directors of the old days, but now there's a new breed of people in football with their own opinions - and with very little experience of actually working in football." Nottingham Forest striker Simon Cox has revealed how Cloughie's legacy is an inspiration for the current squad of players at the City Ground as they challenge for promotion to the Premier League. Cox says some of Brian's famous quotes are printed in big letters around the training ground to inspire the current generation of Forest stars. "Every day we go in to train, we're reminded of Brian Clough," says Cox. "It is there in big slogans - dotted all around the place, and posted in big, bold letters - for us to read. The man was clearly a genius, winning back-to-back European Cups." The quotes include some originally collected and featured on this website and which have now become legendary. One of them followed England's exit from Euro 2000. Cloughie, said: "Players lose you games, not tactics. There's so much crap talked about tactics by people who barely know how to win at dominoes." The parents of a young man who died from a brain tumour have thanked the Brian Clough Memorial Fund for a donation to their charity appeal in memory of their son. Chris and Biba McDermott received a cheque for £7,500 and what they described as a moving letter from the Clough family. This website reported exclusively in November how the couple's appeal was among a number of good causes to receive the final donations from the memorial fund. Mr and Mrs McDermott's son Frazer was just twenty years old when he died in 2011. The couple are raising money to build a respite centre near Nottingham's QMC hospital for families of brain tumour patients. Chris said a letter to them from Elizabeth Clough said: "Our father would have been very inspired by Frazer." Added Chris: "We were really honoured to receive such an amazing letter from such a legendary family in the area, remembering Frazer in that way. It was so moving." The fund for Frazers House aims to raise £300,000. The current total is £250,000, with the memorial fund donation spurring the couple on to reach their goal. You can read more about the donations from the memorial fund HERE. Brian's son Nigel says his Dad would have been saddened by the apparent demise of the FA Cup in some quarters. Nigel - the manager of League One's Sheffield United - was speaking before his side's 2-1 victory over Premiership Aston Villa, whose boss Paul Lambert had said most Premier League managers could 'do without' the cup. Nigel told the Daily Mail (January 2014) that although he had sympathy for Lambert's situation, his Dad would have struggled to be so understanding. "I think he would have been saddened," he said. "He wanted to attack competitions on every front. It didn't matter what it was, the Watney Cup or whatever. He'd pursue it with equal vigour. For instance, we won the Simod Cup when he was at Forest." The FA Cup was the only trophy that eluded Cloughie's treasure trove of success. But now it's all about survival in the Premier League, even for clubs the size of Villa. "Yes, it's sad," said Nigel. "For some clubs, to finish 17th in the Premier League is success - and it's a shame when it's at the expense of the FA Cup. At Forest, the likes of Garry Birtles and John Robertson would play about 150 games in two seasons. "What this throws up is that the gap between the top clubs and the rest is too big. If the gap was smaller, there wouldn't be such a fear of relegation from the Premiership. But I have sympathy for Paul because for Villa to be relegated would be devastating for them financially." Nigel added: "The cup is still special to fans and players, especially English ones."